We have awarded this month’s Pet Of The Month status to 7 month old Cookie who spent a couple of days in our hospital having had a foreign body removed from her intestines. 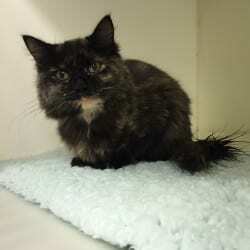 Cookie initially came into us after her worried owner had been on holiday for a week. She had a high temperature and had lost a lot of weight. She was also vomiting and she was unable to eat. She was given treatment to bring her temperature down and we saw her the next day where unfortunately she had made no improvement overnight. 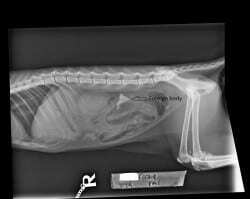 We admitted her into our hospital where she had blood tests taken and an x-ray of her abdomen. Cookie was put on a drip to keep her hydrated and she had an operation to remove the 2 – 2.5cm rubbery foreign body. She stayed under observation for another night and thankfully was eating within a matter of hours after her operation. Cookie was sent home and had a check up a few days later. We are pleased to say she has now fully recovered and is back to behaving like a normal kitten!